The emerald engagement ring meaning is “loyalty, faithfulness and hope” and symbolizes rebirth, new beginnings and “Genuine Love.” Essentially, it is the meaning behind the ring itself that matters -- not necessarily the price you paid for it. An engagement ring is a symbol of the couple's love and devotion -- nothing more. When a man makes the proposal with an emerald engagement ring, he is proposing with the meaning of something representative of his “Real Love” -- symbolizing his love and commitment for a long life together. Emerald is the perfect symbol of love. The beautiful green fire of a sparkling emerald engagement ring shimmering with romance is one of the most important decisions in your life. An unforgettable moment -- the day that you realize the real reason of your existence is to “LOVE” someone. Exotic, rare, beautiful and unique, every genuine emerald contains a birthmark of the earth where it was born; no two emeralds are the same. 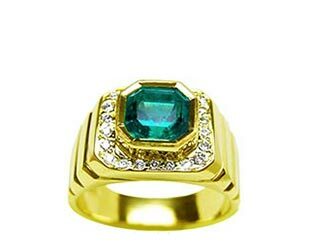 Is an Emerald Ring Suitable as an Engagement Ring?